Book your mid-week October getaway in the Independence suite and save $100! 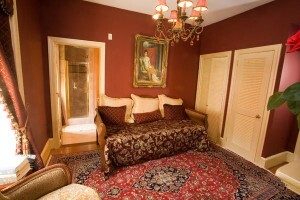 This historic suite dates back to the 1790s with an ornate French king bed, sitting room with daybed and original fireplace, bath with double whirlpool tub and separate shower. Special rate available for Sunday – Thursday stays only in October of 2013. May not be applied to existing reservations or combined with other specials. Mention or enter promo code OCT13 at time of reservation. For more information, please visit www.1840sCarrolltonInn.com!